Thank you Harper for this audiobook! She was kind, but she did have a side she never got to show as she was the nice little wife for her husband. I did like her snark, you never saw it coming. Tristan is looking for smugglers and his quest leads him to her door. And honestly why this was I do not know. i mean I get why, but two and four does not five make. Still he fancies her, she fancies him back. He is the stoic kind, but there is more to him, even if not shown a lot. The boarding house proved to be a fun idea. A weird collection of people with nothing in common. A quest for smugglers, and a couple falling in love. The next book looks to be a fun one too. 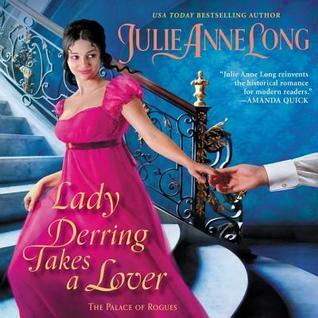 Delilah Swanpool, Countess of Derring, learns the hard way that her husband, Dear Dull Derring, is a lot more interesting-and perfidious-dead than alive. It's a devil of an inheritance, but in the grand ruins of the one building Derring left her, are the seeds of her liberation. And she vows never again to place herself at the mercy of a man. They both believe love is a myth. But a desire beyond reason threatens to destroy the armor around their hearts. Now a shattering decision looms: Will Tristan betray his own code of honor...or choose a love that might be the truest thing he's ever known? Justine Eyre is a fabulous narrator, love her voice too!! I found this to be charming too. A boarding house sounds like a good setting for this type of romance. Sounds like the male lead maybe needs more development? oooo the snark. I love it. You never know who'll show up at a boarding house! Ha a good snarky heroine is perfect. And yes to Justine Eyre for sure. Yeah, that does sound like it'd be entertaining with the boarding house of characters. THis one looks good there! I'm not sure why, but I rarely listen to romance audiobooks. This one does sound fun. Oh, this does sound like fun! Those crazy smugglers!